Now released: TurtleStitch 2.5 - "The Whizzy Needle"
Whereas the first two releases "Amsterdam" (1.0) and "Bordeaux" (2.0) were mostly proof-of-concept and prototype releases, with the second version being a complete rework of the first, the new release "Whizzy needle" does not introduce major background changes but adds a lot of improvements and significant changes in user interface and production quality. In short, there finally is - amongst others - color support, font support, a new embroidery category with stitch types, PNG export, and, of course, a lot of bug fixes (having access to a professional machine really helped in finding all the quirks in the embroidery file encoding process), performance optimizations and UI enhancements (such as the X-Ray density visualization and more). On the platform side, we added tagging support, share buttons, the display of the remix history and minor UI tweaks. The first one, and what was intended from the very beginning as reflected by the project name, is of course in creating embroidery patterns. The second one is in creating vector graphics (SVG) - be it for laser cutters, engravers, for print or for screen. It was always possible to export SVG files from the very beginning - embroidery patterns are vector graphics after all - but, honestly, its support was a bit clumsy in the early days. Nevertheless, our users picked it up and used it to create designs they then fed to laser cutters or plotters, I myself started using it to create quick sketches and prototypes for generative (design) elements. 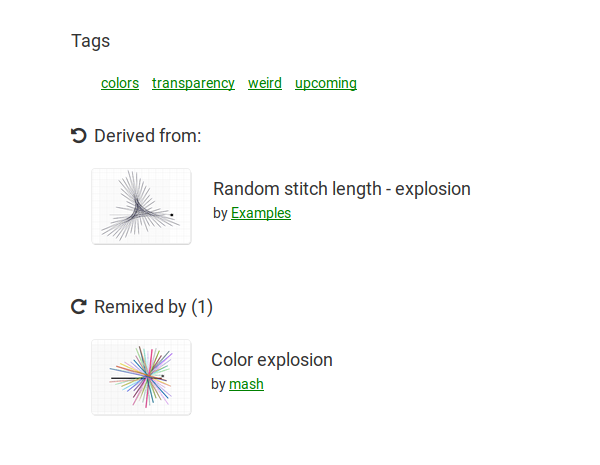 The new release takes the distinctive use cases into account by re-organizing the categories: There is a new category "embroidery" that holds all the blocks dealing with embroidery related functionality, the old "pen" category has the blocks that only makes sense for SVG generation and a new "color" category includes mostly new blocks that deal with colors and can be used for both. If you are coming from an old version of TurtleStitch, the first thing you might notice is that the "move steps in/by" blocks are gone - at least from the block selection. They still exist in the background for compatibility reasons (to keep old projects running), but with "Whizzy Needle", we introduce a new concept of stitch segmentation: Instead of assigning segment length or number to variations of "move" or "goto" blocks, you now define a running stitch once (or any other stitch type), and it will be applied to all commands that follow in your script (or until you reset or choose another stitch type). Take a look into the "embroidery" category or read more on stitch types below. The Embroidery category has all embroidery-specific blocks and introduces some common stitch types: running stitch, a triple run (bean) stitch, cross stitch, zigzag and z-stitch as well as satin and tatami stitch. All of these stitch types have a few options and you add them once to your script, it will then be applied to all move or goto blocks that follow or until you define a new stitch type or reset them either with "reset" or "stop running". Instead of using move 100 by 10 commands as in the old version of TurtleStitch, you would now use a running stitch by 10 and then simply move 100. This will create a line with a distance of 100 steps segmented into ten stitches with a length of 10 steps each. All of these stitch types will auto adjust, that means if you have defined a running stitch by 10 but then move 98 and not 100 it will adjust the segment length to 9.8, trying to figure out the closed length possible that is a divider of the distance to be moved without remainder (Should there be remainder, it will be drawn as a simple line). Most of the stitch types have an option for the length of a segment, some of them also for the width of the pattern. 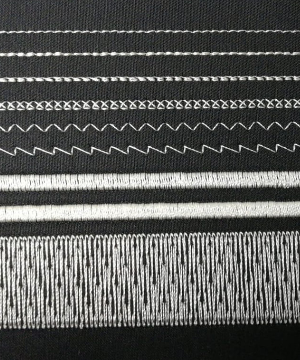 Density in zigzag and z-stitch is the length of one full cycle, one full zigzag (or "wavelength"). All of them have an option for "center" true/false that relates to the turtle and the width of the stitch type pattern, whether the turtle is positioned in the center or on top of the stitch pattern. cross stitch is a version of the cross stitch with a variable length and width. z-stitch makes a zigzag line as well, but with a different pattern. satin stitch is a very dense zigzag. tatami stitch is a fill stitch. It draws dense lines next to each other and it is segmented itself into smaller stitches again (with the interval being what length is for the running stitch) and with a variable offset so that variable fill patterns can be created. 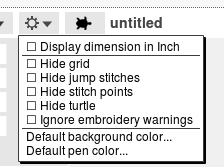 You don't need this category anymore if you create embroidery patterns. There are some news for those who create vector graphics though: We have new blocks to change opacity and pen size and these settings will also be exported as stroke styles into SVG and PNG files. 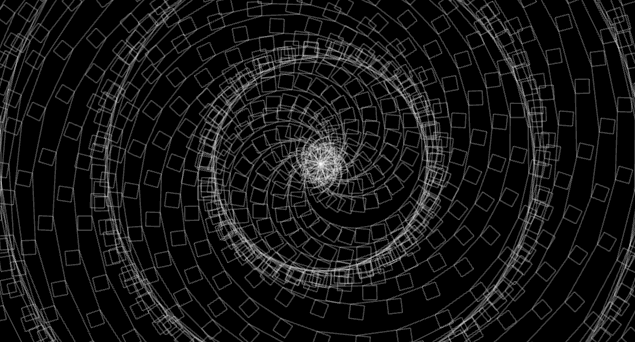 SVG files will encode the lines strings with round line caps. 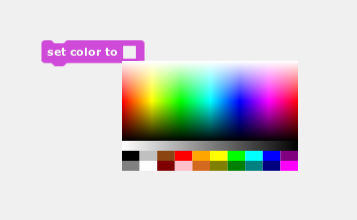 Color support is now functional in all exported file formats depending on the format's limitations. 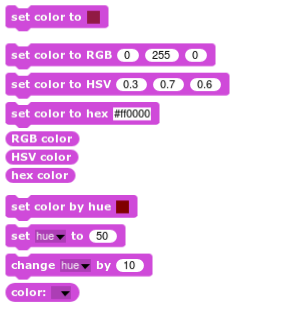 DST and EXP embroidery files only encode color change events but do not include further information about the colors itself (We might look into other formats in the future). You'll also find a new export option "ignore colors during export", in case you want to export a multicolor pattern as a single color one. 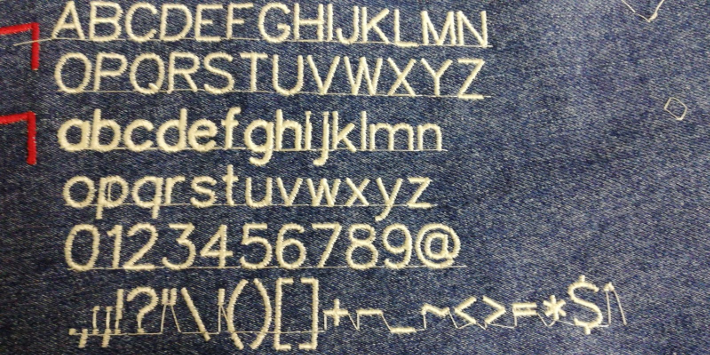 TurtleStitch got its own font! It's an adaption of A.V. Hersheys's Simplex vector font and designed to be flexible. It defines a movement pattern that minimizes jump stitches and can be stitched in various ways with a running stitch or stitch pattern of your choice. You can render the text with a triple stitch, or a satin stitch - it's up to you, just define your stitch type before you write the text with the draw text block. If no stitch type is defined, the text is drawn according to Hersheys's original font data. All viewing options (show/hide grid, inch/millimeters, etc.) moved to a new "turtle" settings menu. These settings are now persistent (stored in your browser's local storage). 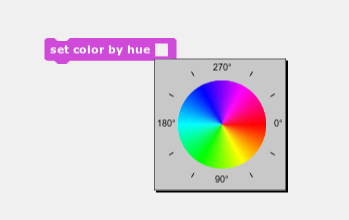 New options include a setting for preferred background color and default pen color. The new X-Ray like visualization option helps you to judge and debug thread density of your design by rendering the stitches in semi-transparent lines. If parts of the pattern turn very white, it's likely too dense! On a project's initial save into the cloud you now have the option to tag them with tags of your choice. Tags for existing projects can be edited via the cloud platform.